In 1923, the Soviet literary scholar Nikolai Belchikov introduced and annotated a previously unpublished play by the late, great Anton Chekhov. And no one seemed to care. By the time Chekhov died in 1904, he was a fixture in Russia’s cultural pantheon. His style as a dramatist was so firmly planted in popular culture that he was parodied in cabaret halls – in a manner not dissimilar to the film Withnail & I ("I loathe those Russian plays. Always full of women staring out of windows, whining about ducks going to Moscow."). But, by the 1910s, cracks in Chekhov's renown were beginning to show. Partly this was due to an underlying suspicion of Chekhov's subtle, ambiguous, ostensibly apolitical writing – it was very much a time of revolutionary agitation and factionalism. Partly it resulted from a belief that his plays were only about the gentry. Partly it reflected the decreasing popularity of Konstantin Stanislavsky's Moscow Art Theatre. Its stagings of Chekhov's work had effectively saved his career as a playwright (he was already a celebrated writer of short stories) but the repertory versions, performed for years on end, had become stagnant and the company’s attitude towards Chekhov proprietary. With the Bolshevik Revolution of 1917, government decrees and a dogmatic press changed the Russian cultural landscape significantly. Maxim Gorky called for a Communist theatre that was epic and romantic, theatre that reflected a "spirit of struggle". He asked, "Which is more useful to the socio-aesthetic education of the masses, Chekhov's Uncle Vanya or Rostand's Cyrano de Bergerac…?" Rostand was in, Chekhov was out. So it was that Belchikov's publication of Chekhov's Unpublished Play appeared to little fanfare. But where did this play come from? In Belchikov's 1923 introduction, he states blandly that the manuscript was among papers "accessioned to the Central State Literary Archive in 1920". It took half a century for a fuller explanation to emerge. When Chekhov's Complete Collected Works and Letters was being prepared by the Soviet Academy of Sciences in the 1970s, Belchikov, now in his 80s, was on the editorial board. In that publication, he gives this account, "In the Moscow bank of the Russo-Azov Company were located the personal safes of its depositors. Here were preserved letters, documents, papers, little items of monetary or personal value, etc. Here among them was the safe of M.P. Chekhova. In it was discovered the manuscript of the play." The ordinariness of "located" and "discovered" attempts to elide the obvious – safe deposits are generally located in banks and are, indeed, specifically meant to stop things being discovered by people who do not own them. Naturally, the manuscript was not news to Maria Pavlovna Chekhova, Chekhov’s sister. She had reported finding amongst her brother’s papers in Yalta "a long play without a title" as early as 1914. As is noted in her letters to theatre identities like Gorky and Vsevolod Meyerhold, she then moved these papers to Moscow, some to her apartment, the more precious into a safe deposit box – the contents of which were subsequently confiscated by the Soviet state during the Russian Civil War, like those of thousands of others. Judging by various details of his account, it could even be the case that Nikolai Belchikov, who had been an eager player in Revolutionary Russia, was there at the bank for this state-sanctioned "discovery". There remains a great deal of uncertainty as to when Chekhov wrote this manuscript. Various timeframes and explanations have been put forward. Based on the letters and memoirs of Chekhov and his siblings, and the political and cultural references included in the text, it seems most plausible that Chekhov began drafting the play in 1878, at the age of 18, under the title Fatherlessness. In a letter to Chekhov from the time, his older brother Alexander gave him some frank advice on the quality of the play, "Two scenes are genuinely elaborated, but if you don’t mind, on the whole, it is an irremissible, though innocent lie. I say innocent because it originates in an undisturbed depth of inner disposition. You know yourself that your play is a lie; you felt it too, but only instinctively, not clearly enough. On the other hand, you have devoted so much energy, love, and torment to it that you will not write another one." By 1881, Chekhov was in medical school in Moscow and not following Alexander's advice. According to the memoirs of another of his brothers, Michael, Chekhov finished a long, "somewhat unwieldy" drama that year. He hoped the actress Maria Yermolova – star of the Maly Theatre – would read it and choose to present it at a benefit performance. Yermolova may have read the play, but she never performed it. By most accounts, the play she turned down was the same play that Chekhov had begun writing three years earlier. The same play that would remain unpublished until 1923. Though 1881 is largely assumed to be the date of completion, some scholars, along with playwright Michael Frayn (who adapted the play as Wild Honey in 1984), have argued that certain details in the published manuscript – a reference to Leopold von Sacher-Masoch, the inclusion of medical Latin – indicate that Chekhov was still working on the text as late as 1883. Either way, his next work for the stage would be Ivanov in 1887. This is a short extract from a longer essay published in the program for The Present, available at the theatre for $10. With articles, rehearsal photos, sketches by Archibald Prize-winning artist Nicholas Harding, notes from writer Andrew Upton and director John Crowley, cast biographies, a historical timeline and much more, the program is a magnificent way to extend and deepen your night at the theatre. 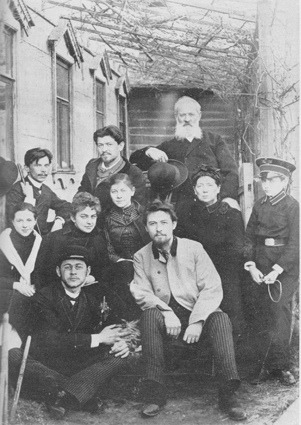 Photo: Anton Chekhov (centre) in his twenties, pictured with friends and family in the yard of their Moscow home on Sadovaya-Kudrinskaya Street, where they lived from 1886-1890.